Many of us wish that we were not born as what we are right now. At one point in your life, you surely have dreamt of being something or someone else, right? Of course, we have no choice on that matter, imagine asking an egg or sperm cell what they want to be when conceived. However, we can always change who we are later on, and that is what one duck did after getting a taste of the doggo life. 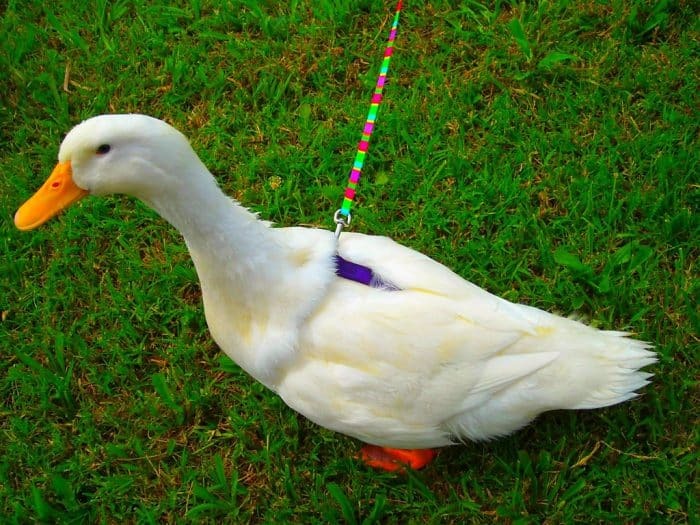 The duck, named Butterball (aww), was rescued by a woman named Katherine McClure. Butterball was actually bleeding to death when Katherine found her. So she nursed her back to health and with the help of Katherine’s trusty family pets. Butterball and Katherine’s dogs actually went along just fine and the pack even welcomed her. One day, Butterball decided to go on one of the doggie walks along with Katherine and her beagle pack. To Katherine’s surprise, Butterball actually loved it. Afterward, Butterball started doing what the other dogs were also doing. Butterball ate dog food, drank from dog water bowls, and even hung out with dogs most of the time. In fact, Katherine also claimed that Butterball does not like all the other rescued ducks in the house. Butterball did like all the other animals, however, but mostly preferred the dogs. Upon closer inspection and analysis, one might even brand Butterball as having Anatidaephobia, which is a phobia for ducks, even if she is a duck herself. Although she seems to believe that she is a dog and not a duck and even shared the attention-mongering of dogs. So move over ugly duckling, we got a new winner.